Originally called as the Malacanang of the North, I prefer to call the place as the famous house at the lakeside. It served as the palace, office and house of the former president and his family. The place has a long and complicated history. Much of this was attributed to the legal cases pursued against the former president and his family. The house was grand but did not impress me well. 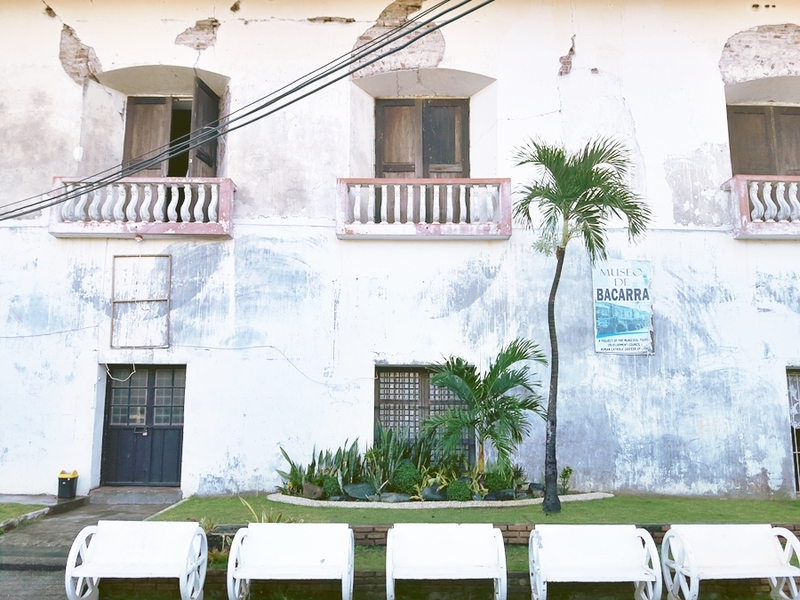 I appreciate old structures, wood and the capiz windows. But the entire structure does not suit my preferences. The only thing I appreciate, the view of the lake. The lake was relaxing and to some extent, breathtaking. I've been savoring my two-week break from work. I just arrived home after meeting some good old friends. I have a lot in my mind now. All of a sudden I feel pressured, bombarded, frustrated and at the same time, sad. This is the least I wanted to feel, especially after having a great time during Christmas. Part of the continuing phase of growing up as an adult, I believe. Whatever this maybe, I hope I'll be able to overcome it. 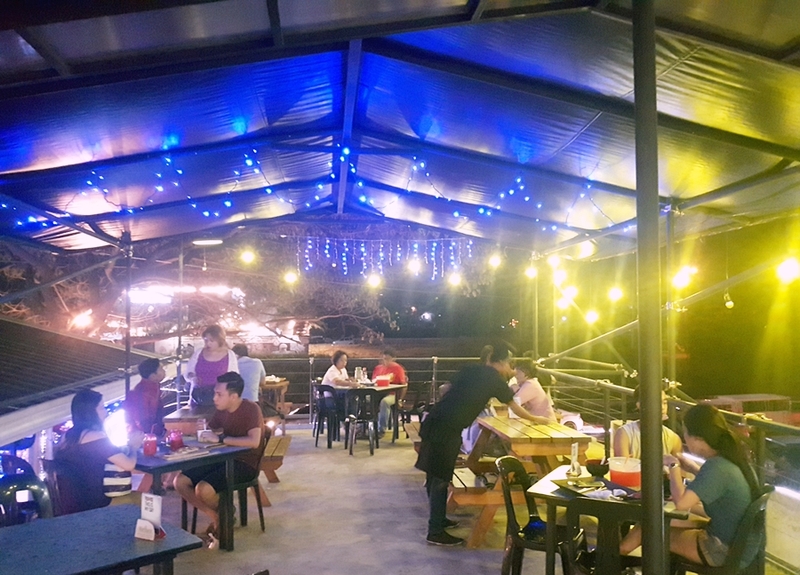 Days before my birthday, I was able to persuade my friend to try a new food hub in my home town. I've been seeing Crave Park early this year. It feels like Mercato and Banchetto, only that the entire place operates on a daily basis. 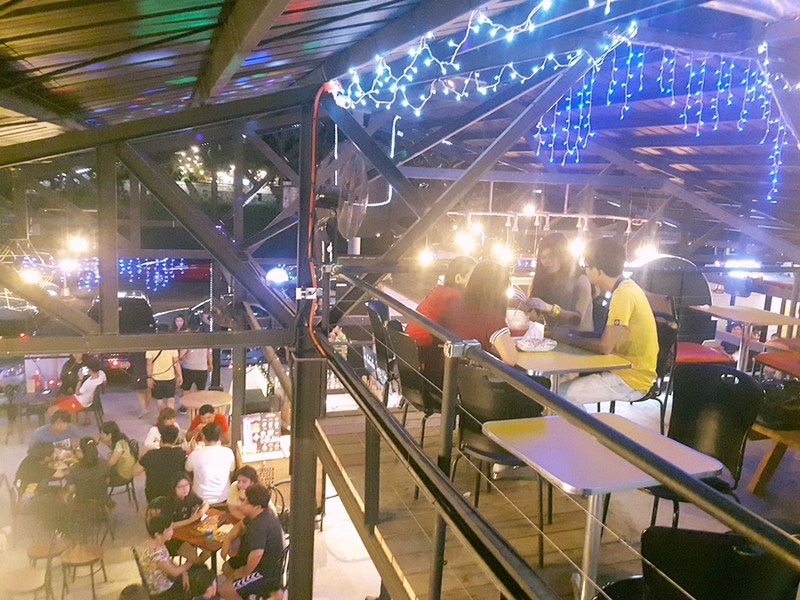 Crave Park's operations starts at 4:00 pm until 12:30 am. In some days, it extends to 1:00 am. The entire place is enclosed by different food stalls. The center area provides seats and tables for diners. The place also has a mezzanine that provides more seats and a few more vacant stalls. So those who are interested to join, I believe Crave Park can still accommodate new ventures. I collected photos of several food joints that captured my interest. Flat Bread offers different pizza in smaller dough. They offer the basic melted cheese and different preset toppings of your choice. 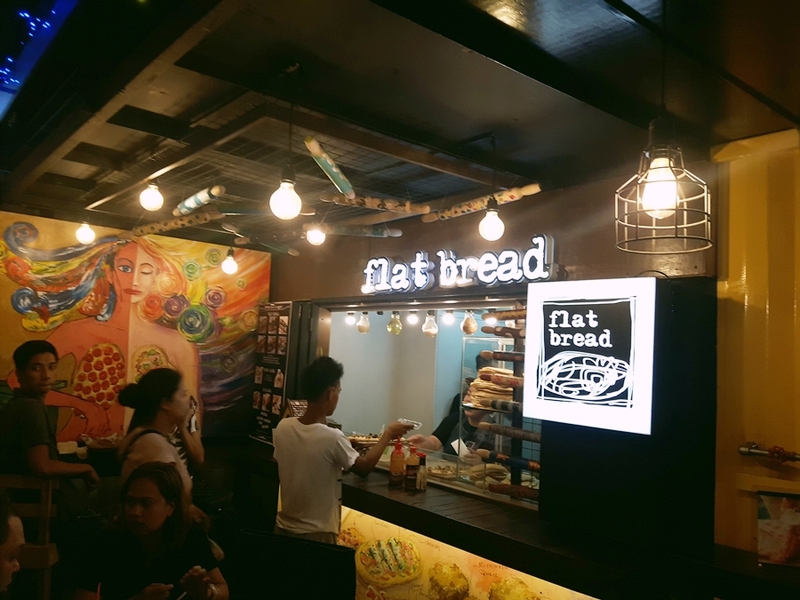 Range of each flat bread is Php 70 to 90. 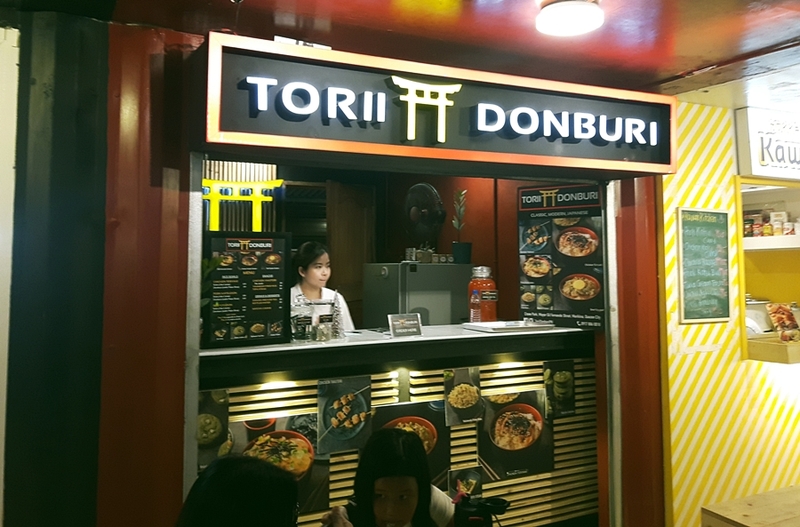 Torii Donburi offers the classic Japanese rice bowls and Yakitori. Prices of rice bowls start at Php 149. 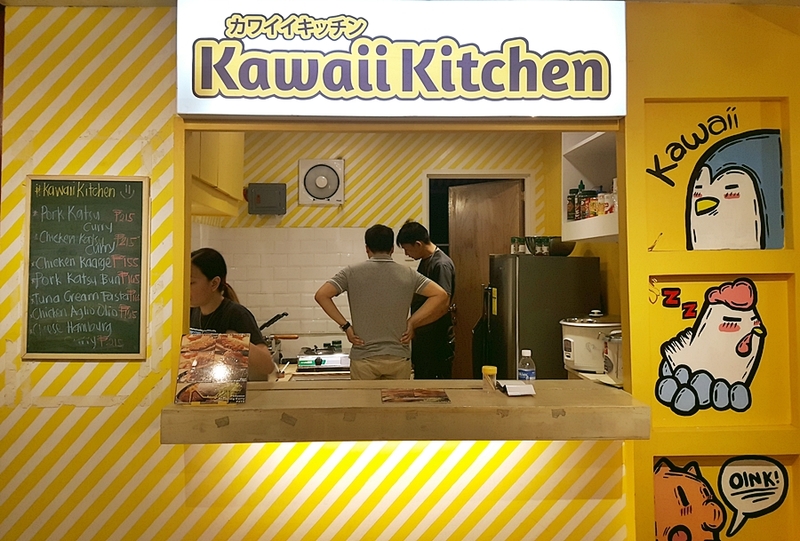 Kawaii Kitchen is another Japanese joint that offers pork katsu curry. If you love grilled sandwiches and cheese, Kwatro Cubanos may work for you. 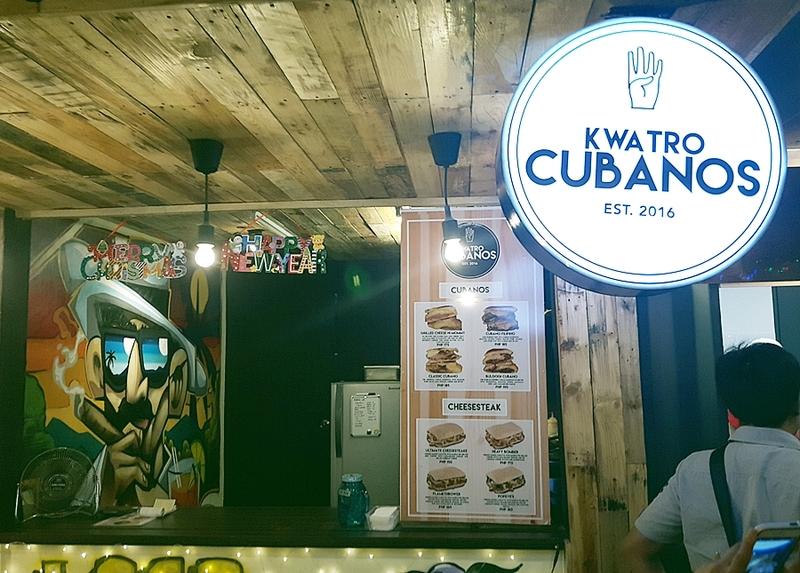 They serve Cuban inspired sandwiches that start from Php 185. 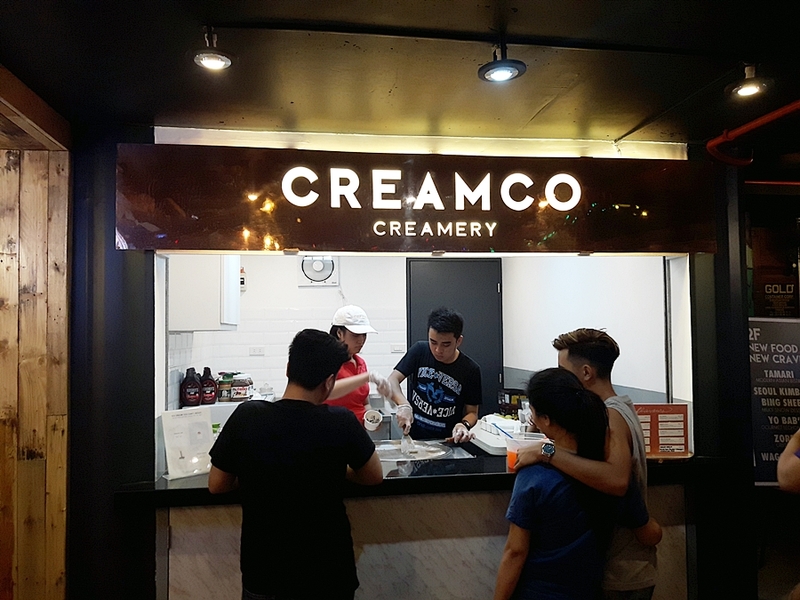 Creamco Creamy serves as the dessert place. They serve fried ice cream that fuses the Italian and Thai styles. An entire food stall dedicated for tempura products is Tokyo Tempura. 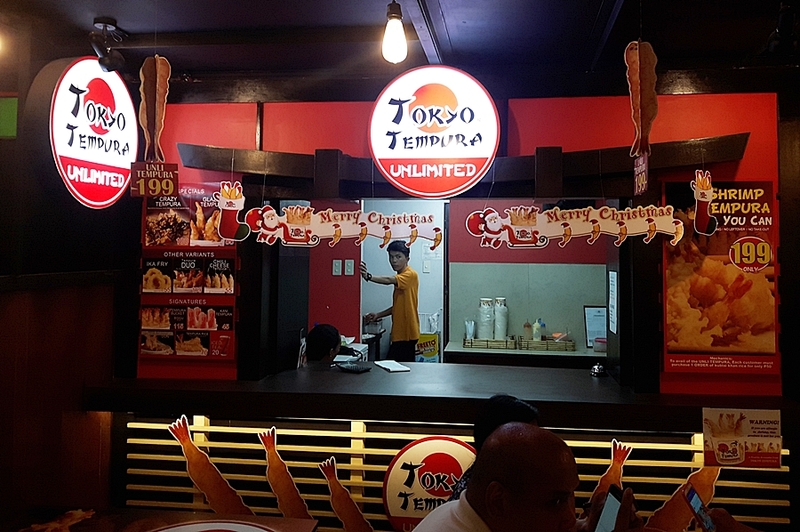 They serve a basket of tempura of different variants that range from Php 85 to 120. 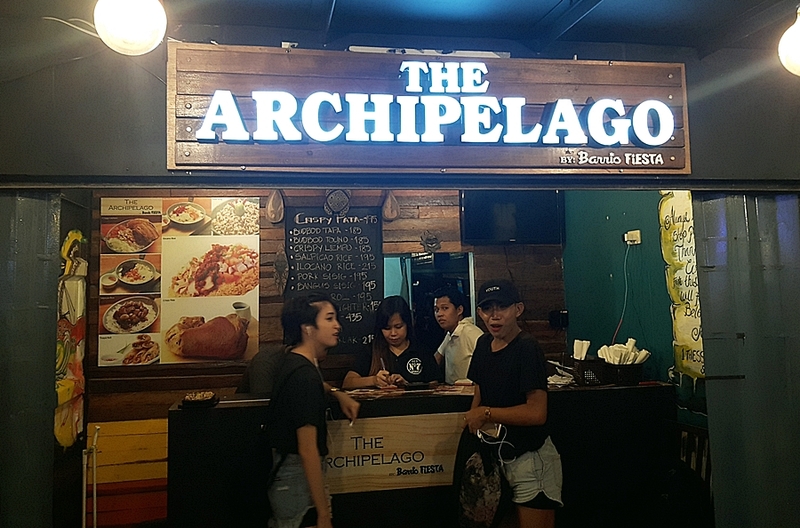 The Archipelago is operated by home grown Barrio Fiesta. 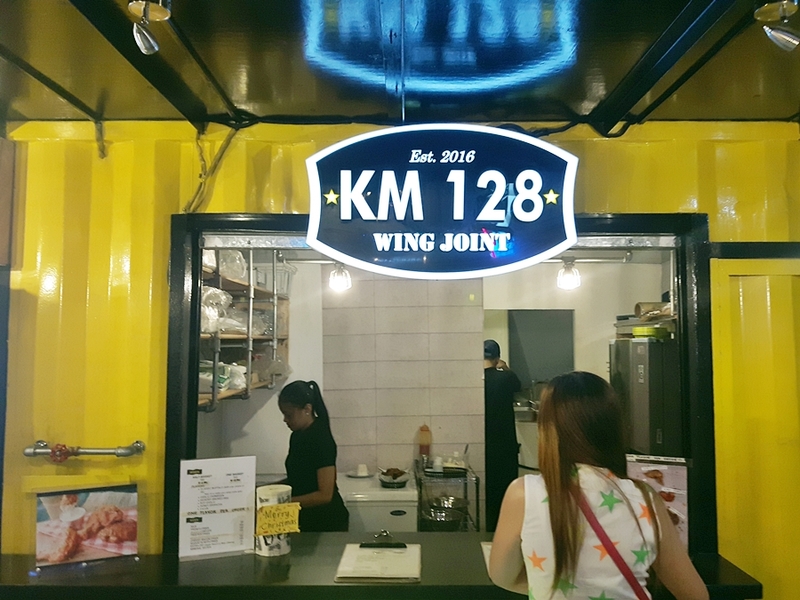 They offer rice toppings of different Filipino dishes such as pata, liempo, lechon kawali, salted egg and so much more. Another food stall that fits those who prefer sandwiches. 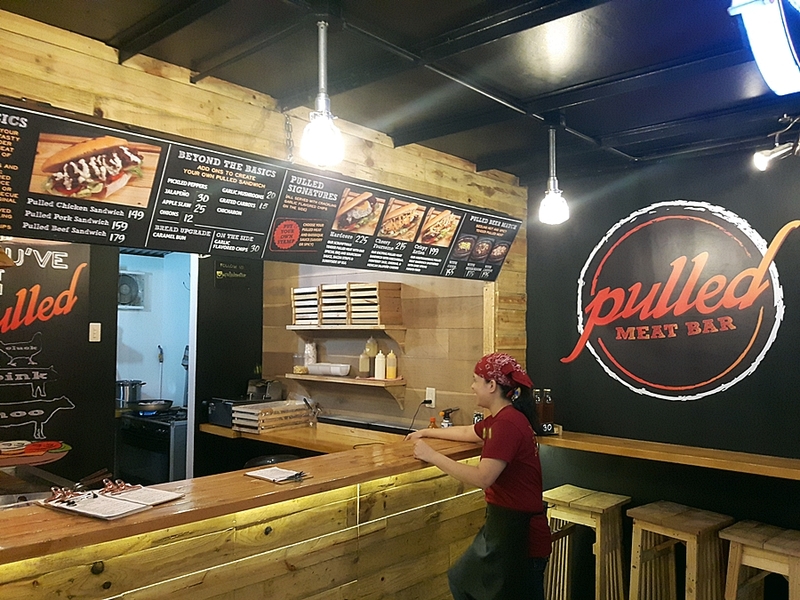 Pulled Meat Bar allows customers to choose from pulled chicken, pork, or beef. Prices of sandwiches here start at around Php 200. 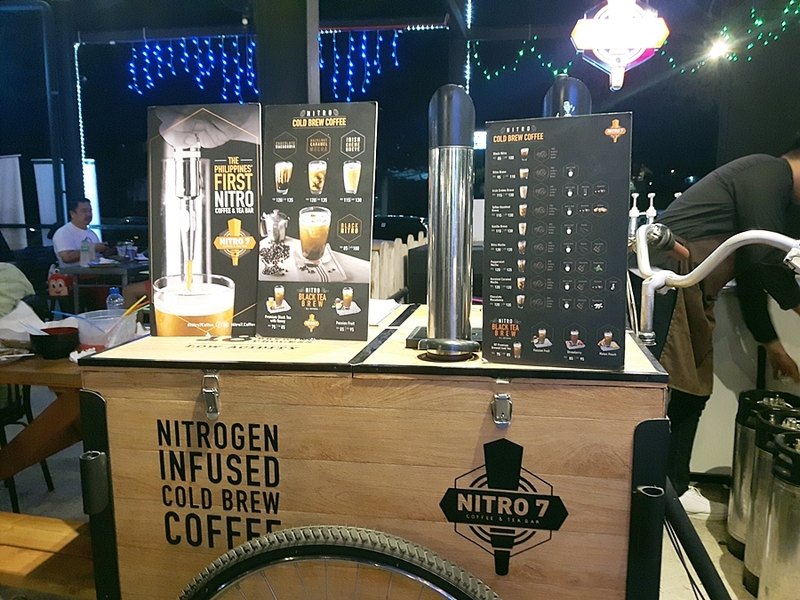 Nitro 7 are nitrogen infused cold brew coffee. I tried one of their non-coffee best sellers, N7 Premium Brewed Iced Tea. 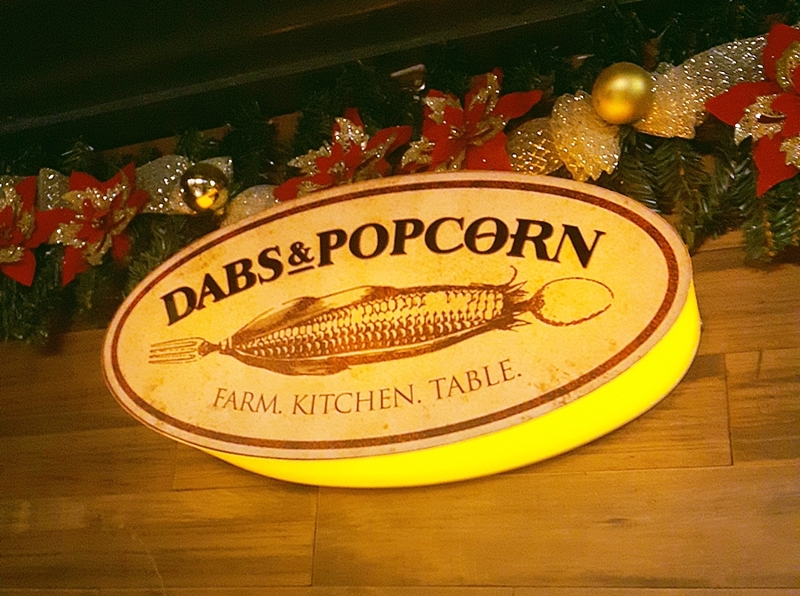 I've been looking forward to try Dabs & Popcorn. They serve corn cobs in different flavor and toppings. I was expecting something like grilled Mexican corn. Turns out, they have a different approach. 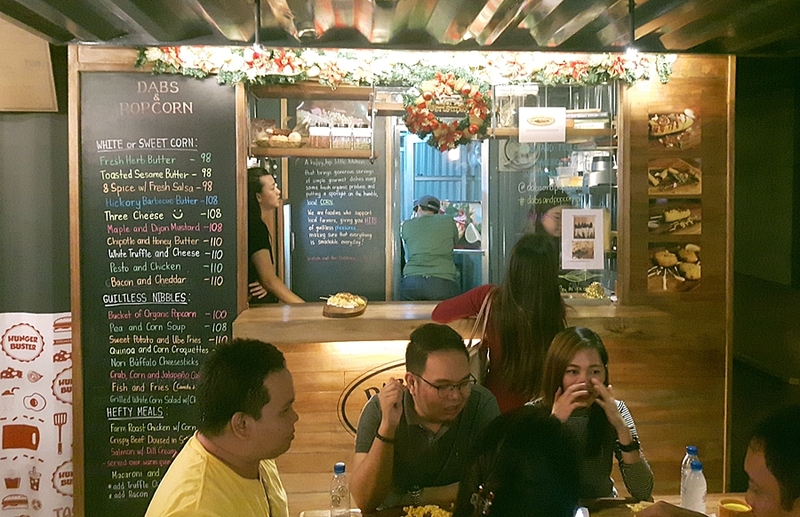 They serve the usual sweet corn with an array of toppings from the menu to choose from. I ordered their best seller, bacon and cheddar. This was what me and my friend Anne had. Chicken wings from KM 128 and flavored corn cobs from Dabs & Popcorn. My verdict for the chicken wings, 3 out of 5 stars. It was just okay. I didn't found anything special. I forgot what flavor we chose though. Also, I've noticed that they limit the flavor of chicken per serving. Unlike in other food stalls or restaurants where customer can choose more than one flavor for a basket of chicken wings. The Dabs & Popcorn made it for me. Sweet corn infused with dressing and bacon was for the win. I was expecting something like grilled Mexican corn. Surprisingly, they served something better and unique. Also in the photo was Nitro's Passion Fruit Brewed Iced tea. I like the different flavor but this is something I can pass on next time. Overall, I can rate my first experience with Crave Park as satisfactory. We went on a Saturday and was expecting a highly populated place. We arrived a little earlier so we were not bothered or hassled by the jam-packed crowd. Like any other food park, landing on the right food stall is the challenge. I guess I wasn't able to select the best food stalls in my first attempt. On my next visit, I'm willing to skip KM 128 and Nitro 7. I would love to explore and try the other establishments. POBox.ph delivered but they are poor in communication and online updates. LBC Shipping Cart delivered the fastest at the lowest cost. Problem is, my own review has been plagued by dissatisfied customers. As it appears to me, LBC Shipping Cart's services deteriorated. I wanted to hire Johnny Air again, but I'm afraid of the exorbitant fees. 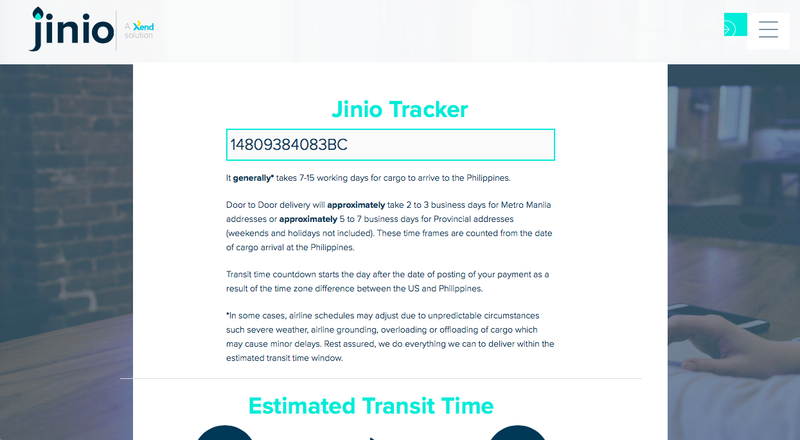 I searched for other forwarding companies and encountered Jinio. It's powered by local shipping company, Xend. I encountered a positive review and was quite surprised that I gave in. I don't normally rely on one or two reviews. Haha Instincts probably pushed me to try Jinio. Like LBC Shipping Cart and POBox.ph, one needs to create a personal account to avail of Jinio's services. You can directly use your Facebook or Google account for convenience. Signing up is easy. 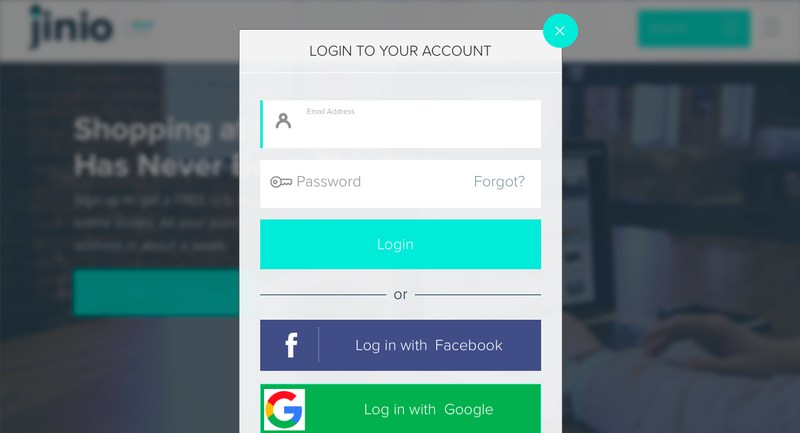 The little inconvenient and complicated part of signing up with Jinio is the verification process. You need to print, fill out, scan and upload this downloadable form. It serves as your consent document. It's something like allowing Jinio to receive all packages on your behalf. Added to this, you need to upload scanned copies of your IDs with a valid local address. Hassle, right? I uploaded scanned copies of my SSS ID and Passport. Unfortunately, since the two IDs don't contain any address, I was emailed and asked to submit a supporting document. If I remember it right, I submitted a screenshot of my credit card's billing statement. In a matter of minutes, my account was verified. This is what I appreciate about Jinio. They are very efficient in communication. I also sent further inquiries via email. They respond so fast! Most of their replies don't appear to be one of those canned messages. There's really someone who handles the communication. After my account was verified, I ordered my items, taking advantage of the Black Friday Sale. Like the usual process in most cargo forwarding companies, I used Jinio's address. The address will be sent once your account is verified or you can always check your account settings. I monitored my shipments from UPS's tracking system. All my items were successfully delivered. I didn't have to wait long. Jinio immediately updated my account and best of all, they sent a notification email. 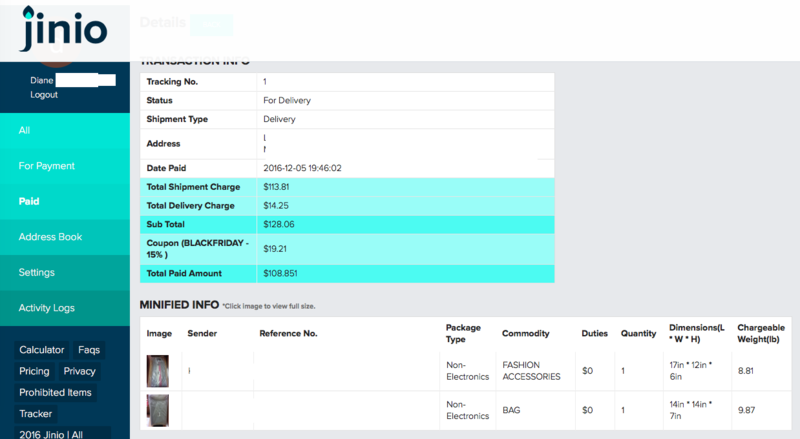 Like LBC Shipping Cart, they took photos of my items and had it uploaded in my account. It would appear to be something like this. Only that, the status should indicate "for payment." I took this screenshot after I rendered my payment. 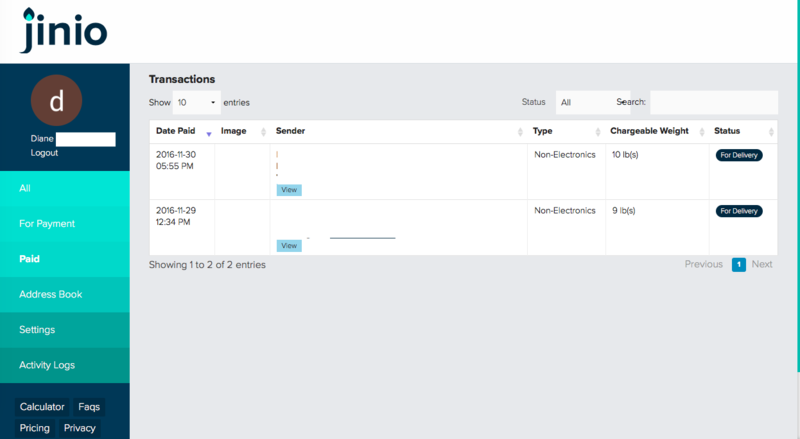 Jinio claims they have this MINIFY process. This is what sets them apart from other cargo forwarding companies. They minimize the contents of your shipment by removing excess and unnecessary packacging materials. This way, costs will be reduced for the customer. With this, I also got the impression that they consolidate multiple shipments. This was actually my best experience with LBC Shipping Cart, which I'm hoping to experience with Jinio. I thought everything was working well not until I received the fees I needed to pay. To be honest, the shipping costs to Manila were way beyond my expectation. I had no choice then. My saving grace was their BLACKFRIDAY discount, which is still ongoing. You can avail 15% discount of the total shipping cost until December 31. 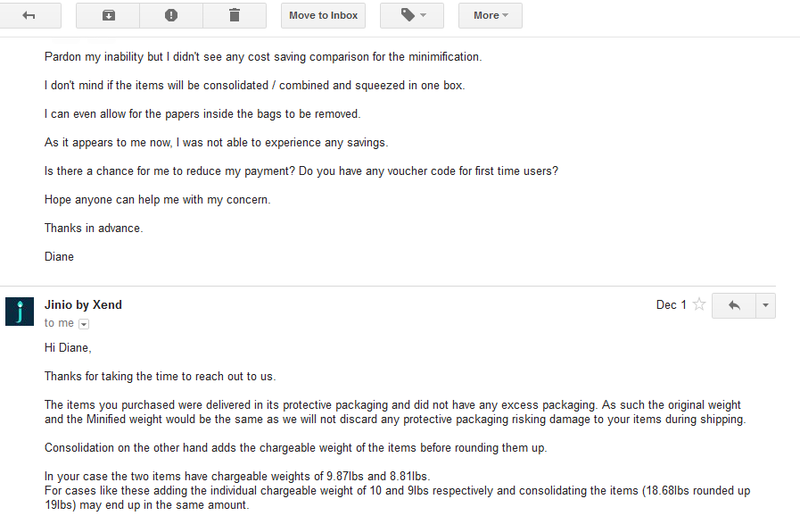 Before payment, I also emailed Jinio. I was really surprised with the fees. I rested my case. I settled my bill via Paypal. By the way as of writing this, Jinio only accepts credit card and Paypal as means of payment. The total paid amount still hurts me this date. :( I was hoping to save on costs by avoiding Johnny Air. As it appears, looks like Jinio costs the same as Johnny Air. The minify process did not work for me. 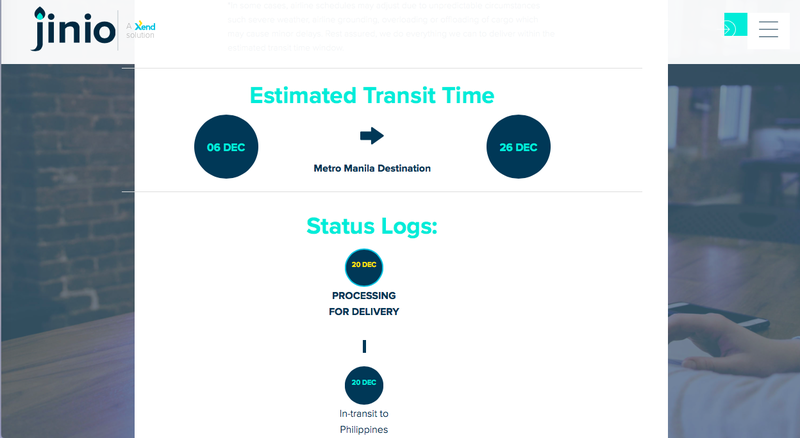 A way to reduce your shipping cost is to pick up your shipments in Xend's Mandaluyong office. You have the option to have the item delivered to your address or pick up in Xend's main office. I wanted to avoid the hassle so I requested door to door delivery. Just minutes after I settled my bill, I received a confirmation email and my account got updated too. This is the first time I experienced this from a cargo forwarding company. I have a time table of my shipping status. I was expecting to receive everything after Christmas. But a surprise came, everything arrived on December 20!!! Setting aside their own timetable, actual cycle time was 14 working days. Given the peak of the holiday shipments, I believe Jinio's performance is not bad. However, Jinio is a little delayed compared with Johnny Air. With Johnny Air, I can receive my shipments in less than 2 weeks. Although the disadvantage, Johnny Air does not deliver. You have to pick up everything from their office. This was after I removed the plastic wraps around. Yes I appreciate that the boxes were well protected. The two items after all the papers and fillers were removed. The two bags can fit in the bigger box... with more than adequate space to spare for the paper fillers, plastic and all the protective items. 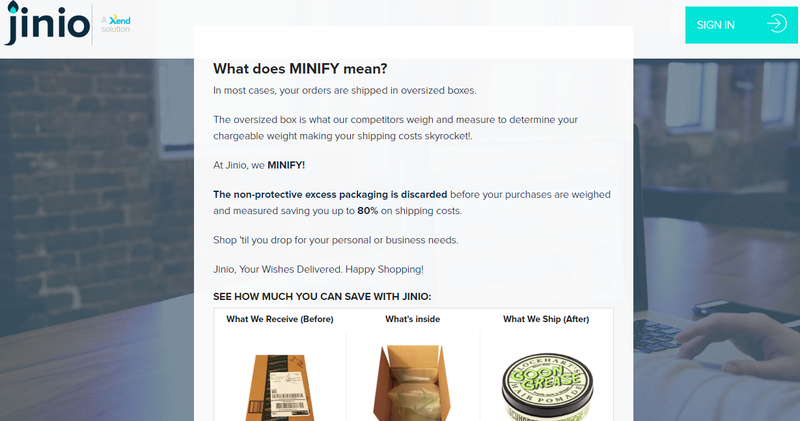 This was something I was hoping that Jinio will undertake with their minify service feature. Last year, LBC Shipping Cart was excellent in this aspect. LBC used another box to consolidate and minimize my multiple items. I was expecting the same initiative with Jinio. Turns out, this process was not applied. Also, I think my assumption that they consolidate items did not hold true. Looking at their example, I assume they provide smaller boxes to help customers reduce their costs. But as I have said, it didn't happen in my case. To summarize my experience, here are the personal pros and cons I found with Jinio. 1. They are prompt in responding to email and inquiries. 2. 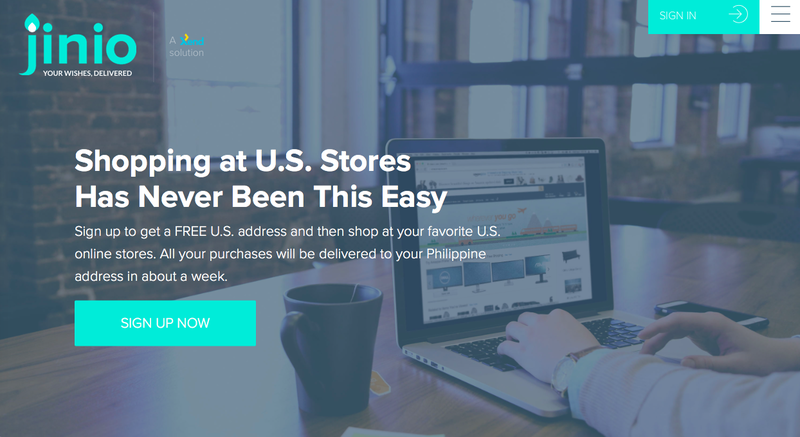 They immediately update the client's personal account once the items arrive in their US address. 3. They have a detailed timetable of your shipment. Although it's not a real time tracking system, it's way better than simply relying on a particular number of working days. 3. They take photos of your items. Some people might dislike this but I appreciate it in my case. 4. They offer door to door delivery... for an additional fee though. Unlike Johnny Air where you have to visit their branch / head office. 5. They deliver fast given the peak of their holiday shipments. Although a little slower than Johnny Air. 1. The verification process. I find it a little inconvenient to submit valid IDs and a proof of billing. Maybe one ID will work. 2. They only accept Paypal and credit card as payment mechanisms. No provision for local bank deposit. 4. It emerged expensive, almost same rates with Johnny Air. Overall, I can say that I had a good experience with Jinio. My items arrived way before their promised cycle time. My source of dissatisfaction was from their claimed minify process that did not seem to work. Probably, if the person who packed my items would have been more resourceful and considerate.... I would be able to save on costs. After months, weeks and days of waiting, this is it! My favorite time of the year has come!!! I'm currently savoring my two-week break from work. I have been editing photos, reading books, watching movies and K dramas and occasionally going out with the family and some good old friends. In a few minutes, I'll be on a road trip with my family. We are bound to meet some relatives we haven't seen in a year. Wishing everyone all the love, happiness and the greatest memories. Merry Christmas everyone! The entire region has everything to offer. While I knew some historical landmarks and popular sites in Ilocos, I was overwhelmed with all the places I was able to visit. Part of our itinerary was a quick tour to some old churches. 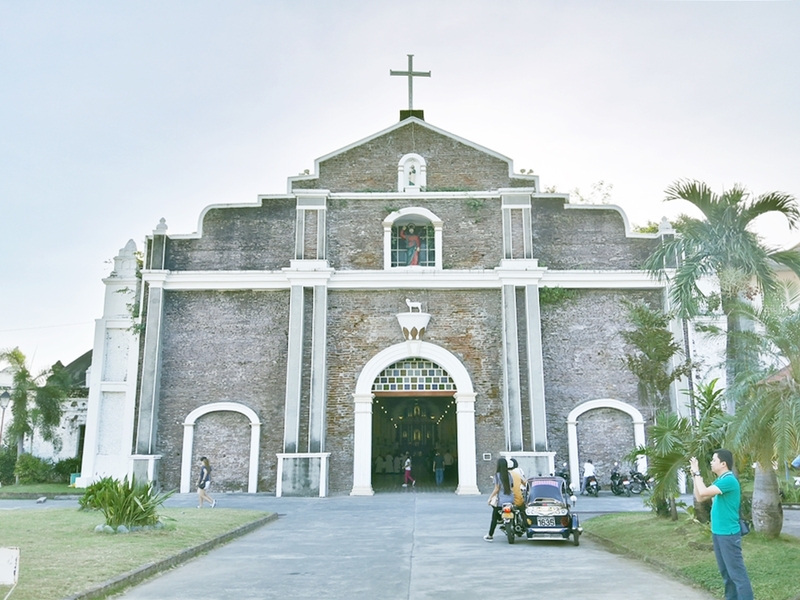 We were able to see three old churches namely, The Saint Augustine Church (more commonly known as Paoay Church), Shrine of Our Lady of Charity (Bantay Church) which also houses the Bantay Watch Tower, and Church of Saint Andrew the Apostle (Bacarra Church). 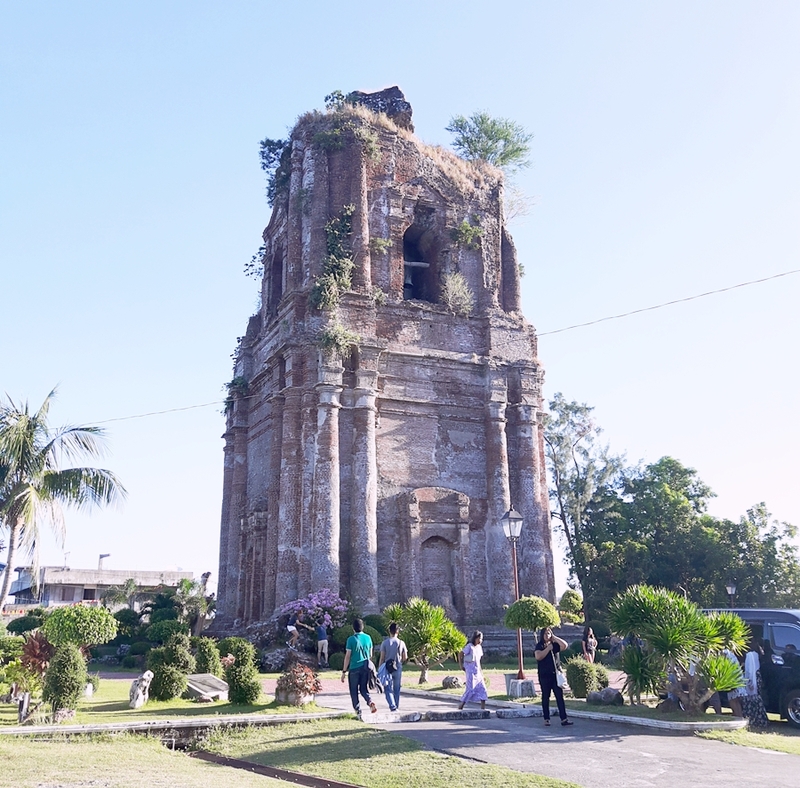 The Bantay Church is more popular because of its Bell Tower, which also served as a watch tower during Word War I. Like many tourists, it's the Bantay Watch Tower that amazed me. It's quite unusual for the bell tower to be situated far from the main church. History has an explanation for this. One reason I believe is to provide better protection and security for the church. The tower also sits in a picture perfect spot. It is surrounded by a lush land area and accessed by a grand concrete staircase. Inside the tower are old red bricks and wood that have existed since the 15th century. Bacarra Church was one of the last items in our itinerary. We arrived quite early so we were not able to see the Church's museum. The bell tower was likewise not accessible for guests. I'm not sure if it is still functional though. Regardless, the tower has its own unique charm. The classic red bricks, surrounding garden, and its survival amidst all the ruins captivated me. I knew Ilocos has more old churches to offer. I've seen several churches during our road trip. Unfortunately, not all places are considered in our itinerary. I've seen small and old churches that piqued my interest. I'm actually after the underrated and the unpopular sites. 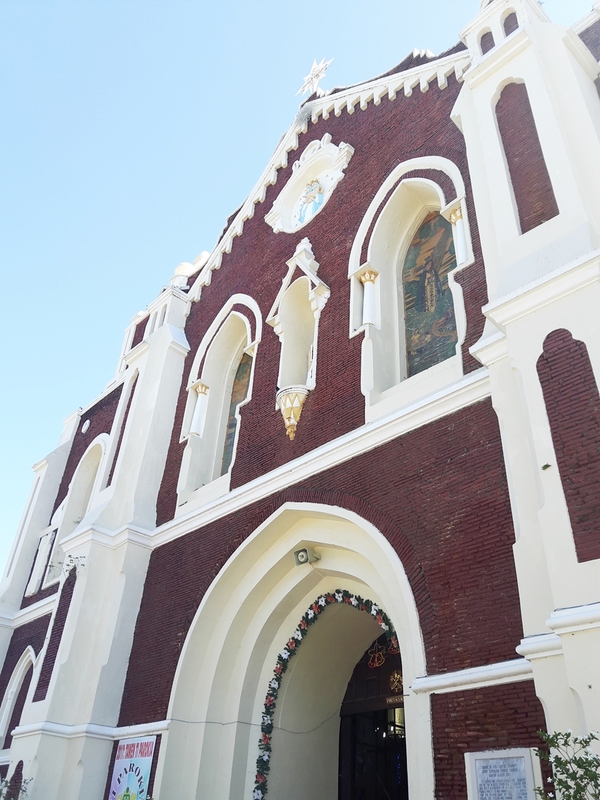 If I will have the chance to revisit Ilocos, I would surely check out the unpopular and interesting churches.